Available for the 2006-2010 Jeep SRT8. Featuring the V-3 Si centrifugal supercharger with Vortech's air-to-water double pass charge cooler system. The complete system will boost your stock Jeep to 560 ground pounding horsepower and 510 lb/ft of stump pulling torque. Tuner kits are the same as complete systems except without the fuel system upgrades or ECM reprogramming. This allows for custom tuning and fuel modifications that the custom tuner or racer may prefer. 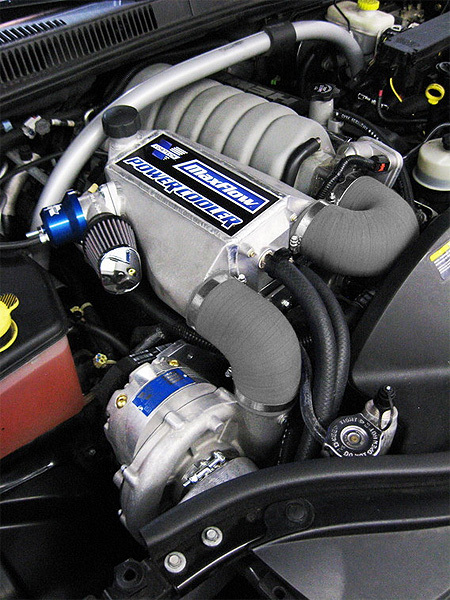 Vortech has supercharger options for various types of racing or boost level. For continued use, such as road racing, the V-2 series superchargers share the engine's oiling system. This approach is more suitable for continued boost conditions and allows for the addition of an oil cooler or filter. Call CAPA for more information on the many upgrades and options available.